Press E and Q to fire cannonballs. You can take a look at that in PlayerInputController.cs, which we’ll be editing later. Open a new terminal window, and navigate to the root directory of your project. Run spatial local worker launch UnityClient default. This will launch another Unity client, connecting to the same game. Make sure you can see both game windows at the same time. In one of the game windows, move the ship so you can see the other ship clearly. Press E or Q to fire a cannon. Now you should be able to see the problem: only the player’s own client visualizes the cannonball firing. Because they’re local GameObjects, they’re not visible to other clients. In this lesson, you’ll fix that. In a SpatialOS game, you have to decide what things you want to synchronise to SpatialOS and what things you don’t. In order to synchronise something, it needs to be expressed as an aspect of a component on an entity. If something’s part of a component on an entity, SpatialOS makes sure that other workers and clients have access to it. If it’s not, no other worker or client will have access to it. Keeping some things local is fine. For example, your player might be able to change the colour of their UI. Nobody but that player needs that information. But you can see, in the case of firing cannonballs, that some information needs to be shared, so that all clients know that a cannonball has been fired. One way of solving the problem is to make the cannonballs into entities. This would make them visible to other clients in the same way your ship is. But entities make most sense when they’re long-lived objects, especially ones that move around the world. There’s actually a simpler (and cheaper in terms of bandwidth overhead) way to get the effect you want: you can use a feature of components called events. In the previous lesson, you used properties, which are persistent values stored in a component. Events are also part of a component, but they’re transient. You send an event update in the same way you do a property update. And just like a property change, any worker that can “see” an entity will receive the event update. There are a few different steps to join everything up to make it work. 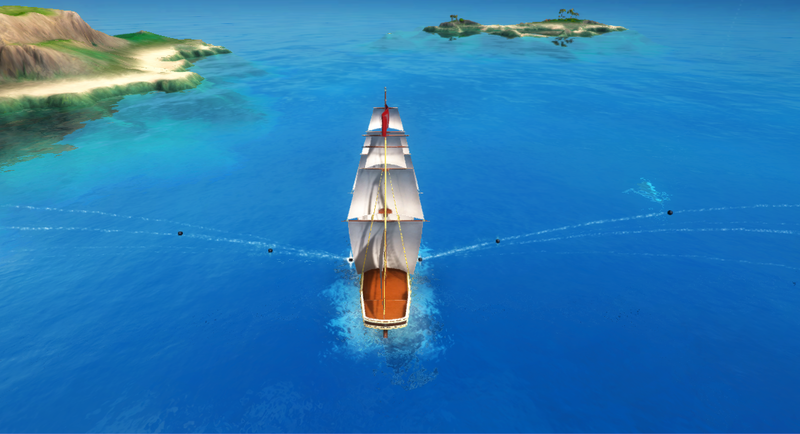 In lesson 3, you used the properties on the ShipControls component to move pirate ships around. In this lesson, you’re going to add something new to ShipControls. Components are defined in a project’s schema. SpatialOS uses this schema to generate code which workers use to read and write to components. It’s written in schemalang, and it’s located in the schema directory of the project. From the project root directory, navigate to schema/improbable/ship/ShipControls.schema. This schema file is where ShipControls is defined. Look at this file. At the moment, it contains two properties: target_steering and target_speed. // The component event for triggering firing cannonballs left. // The component event for triggering firing cannonballs right. The declarations for the FireLeft and FireRight types don’t have any fields: they are empty objects. They could store data that is synchronized when the events are triggered. For example, they could store the time at which the key press was made. We’ll leave them empty for now. You’ve changed the schema. Whenever you change schema, you need to regenerate the generated code. In the SpatialOS window, under Generate from schema, click Build. This generates code that workers can use to read and modify components, and allows SpatialOS to synchronize components across the system. When the player presses E or Q, you want to trigger the Fire component events you just created. You’ll do this from a script that exists on the PlayerShip GameObject on all UnityClients. But when a player hits E or Q, you only want their local instance of PlayerShip to trigger the FireLeft/ FireRight event. So it’s important to make sure that this script will only be enabled on the PlayerShip on which the UnityClient has write access: that is, the ship that belongs to the player. Open the project in the Unity Editor. In the EntityPrefabs folder, double-click on the PlayerShip prefab. On the PlayerShip prefab is a PlayerInputController.cs script. Double-click on it to open it in your C# IDE. You came across [Require] in the previous lesson. Requiring a component writer means that this script will only be enabled on the worker with write access to ShipControls. It won’t run on other UnityClients, or on a UnityWorker. This is important, because it means only the player can control their own ship. The script reads the user input on each frame, and updates the ShipControls component with the new values. The steering and speed values are taken from the Vertical and Horizontal axes, as defined in the Unity input manager. It also checks for the Q and E keys being pressed, but it just creates local GameObjects. You want to replace this with code that sends an event update to SpatialOS. You sent an update in the previous lesson using ShipControlsWriter.Send(new ShipControls.Update(). But instead of using .Set<name of property>, you trigger an event using .Add<name of event>. Youv'e removed the code that actually fired the cannons, and instead triggered an event. ## 4. Fire the cannons! problem you saw earlier was that other clients weren't firing cannonballs. and respond by firing the cannon (creating the local cannonball GameObject). 1. In the Unity Editor, select the `PlayerShip` prefab. 2. Open the script `CannonFirer.cs`. and `using Improbable.Unity.Visualizer;` (for the `Require` syntax). 4. Add a `[Require]` statement, but not for a component writer: for a `Reader`. Among other things, you can use it to register a callback for when events and properties change. on the `ShipControls` component are triggered. so the cannonballs travel in the correct direction. will run every time the events are triggered. > the MonoBehaviour is enabled - which includes when an entity is first created, and when it crosses worker boundaries. When the terminal window says SpatialOS is ready, run a client (open the scene UnityClient.unity, then click Play ▶), and click CONNECT. As before, make sure you can see both game windows at the same time, and move one of the ships so you can see the other ship clearly. To stop spatial local launch running, switch to that terminal window and use Ctrl + C.
This fired cannonballs, but also made sure those cannonballs are fired on all clients. Your cannonballs are firing, but at the moment, if they hit an enemy, nothing will happen. In the next lesson you’ll detect the collision between cannonballs and enemy ships on the UnityWorker.